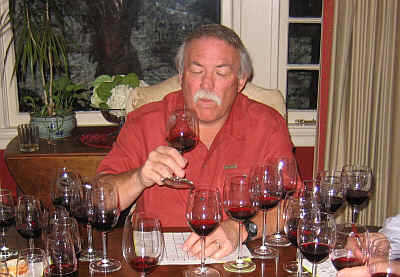 Having tasted some really nice Spanish wines from the 2004 vintage, I assembled a set of Riojas for the Vino Fino boys to evaluate. We had wines in a range of prices, from entry-level Crianza (minimum of 24 months aging before release, with a year in wood) and Reserva level wines (3 years of aging, with a minimum of a year in oak). We had some "traditional" producers (Riscal, El Coto) and some new-wave vintners (Benjamin Romeo). We had twelve tasters and I cannot recall ever seeing a wine with nearly the entire group weighing in at one end of the ranking spectrum or the other! 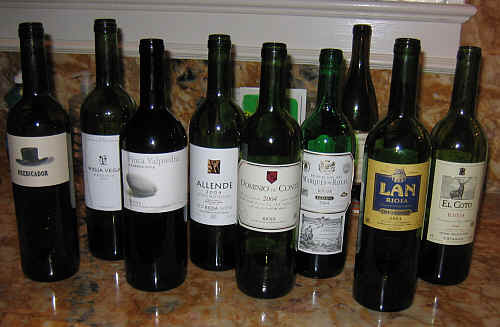 But one wine had 3 firsts and two seconds, along with 5 last place tallies. With good clarity and a light ruby color, the "flaw" of this wine was merely its intensity, or lack thereof. El Coto's crianza shows a touch of spice and a very light berry fragrance. It's a simple wine with no particular distinction...I found it merely a "superficial" Rioja...it's perfectly drinkable, but you won't get any major thrill from it. I found it quite "ordinary" and, as a result, awarded it no stars on my three star scale. It will probably not repay cellaring, but should last for several more years. I was disappointed in this wine, as Riscal should have a clean, well-made wine. This shows medium ruby color. I did not appreciate the leathery, Brettanomyces fragrances on the nose. 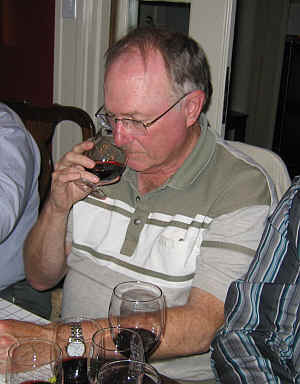 Some tasters are not put off by this characteristic of a wine, but I find it to be a flaw. 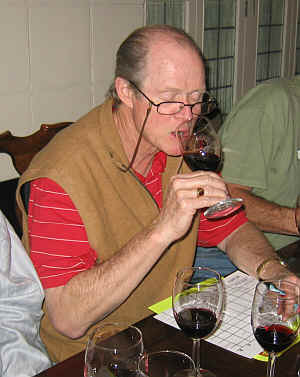 The flavors were better than the nose, for example, but the aromas are earthy and leathery. No stars from me. Your mileage, however, may vary. The flavors of the wine echo the promise of the aromas, showing nice, woodsy, dill-like spice tones. It's a medium-full bodied wine, but not heavy, of course, thanks to the acidity. I'd give this 2 stars on my three star scale...maybe it's worthy of 2-and-a-half. I suspect this will cellar well, too, for 5-8+ years. Clear in appearance and with medium ruby color, the Finca Valpiedra wine showed ripe to slightly over-ripe notes at the start. There's a hint of raspberry jam to the fragrance of this wine and, later, a hint of oak emerges. It's dry and medium-bodied. I found light tannins to this wine and rather nice, fairly typical "Rioja" character. Good acidity and mild tannins make for a good palate cleanser with food...I suspect this will develop a bit of additional complexity over the next three to eight years. One-and-a-half stars. Allende's wine is clear in appearance and shows medium+ dark ruby color. There's a woodsy element to start and some earthy and mildly herbal tones on the nose. I found dark fruit notes reminiscent of black currants. 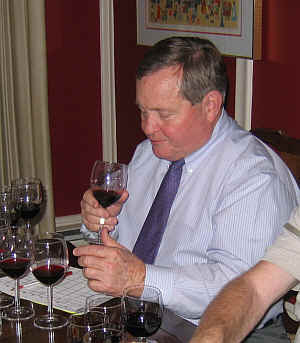 The wine is dry on the palate and medium-full bodied. It offers a nice level of acidity, with dark fruit flavors. It's a moderately tannic, mildly astringent wine. I think the nose promises more than the palate delivers presently, but it may grow more complex with cellaring. One-and-a-half stars+. Displaying medium ruby color, this wine features lots of sweet, woodsy notes on the nose. Nicely oaked, I found the fragrances to be quite enchanting and promising. There's plenty of wood along with a reasonable level of fruit. It's medium-full bodied and dry. 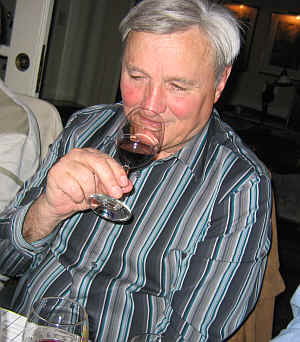 I felt the wine was a shade too tannic in the mouth, showing ripe fruit and a coarse or astringent quality. I gave this one star presently...if it softens and arrives at a point of balance, it will be a more highly rated wine. This is the work of a fellow who's become a bit of a celebrity after making many highly-rated wines at the Artadi winery in Rioja. Frankly, I never did find those to be especially classic. 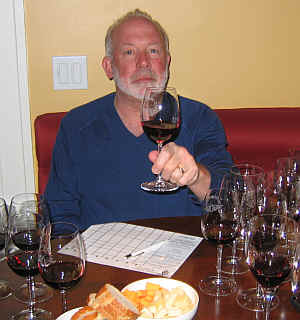 I've seen favorable reviews for this fellow's wines, though and so I included his "entry level" bottling for our tasting. The wine is clear in appearance and unusually dark in color...The aromas are a delight, but I can't say the wine is at all reminiscent of classically-styled Rioja. The fruit is remarkably intense and displays notes of blackberry and a vaguely floral quality. I was reminded of a lovely Beaujolais-styled Rioja we have in the shop from Bodegas Altun called "Albiker" ($13.99). This Predicador wine is probably fermented to some degree with a percentage of whole berries. It's a medium-full bodied red. The texture is plush and rich on the palate, balanced by a bit of tannin and astringency. I don't know if this will age well, as all that youthful fruit is so enchanting now...It's a striking wine, to be sure, but definitely "new wave." If you're looking for classic, unmistakable Rioja, this is not it. I'd give it a star-and-a-half for being a nice, enjoyable wine, but it veers off the road as Rioja.